Some good news for me, it looks like I have a serviceable Mac again. I will need to sort out some of the software and do some upgrades to the software, but things are looking up. Can the same be said for the fishing? Well it is steadily improving as our regular contributor Leo reports. 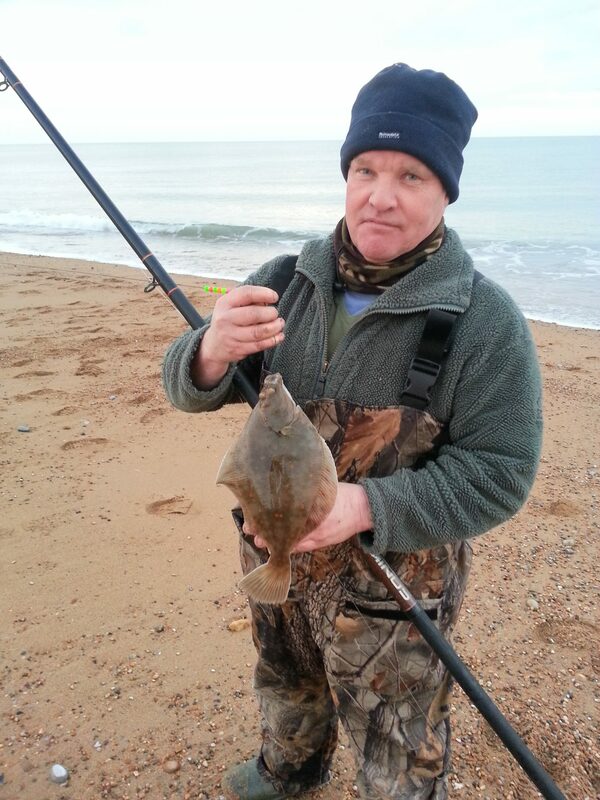 He sent me this picture of his mate Martin who managed a few Plaice down at West Bexington. They also had a load of Rockling and Pout. I am hoping to get out today and do some fishing and photography. I have some good articles that I have written that just need some pictures to finish them off. Chesil Beach: Flat calm and almost clear with just a tinge of colour. Weymouth Bay: Wavelets with a slight colour in the water. Chesil Beach forecast: The next few weeks will see a number of Plaice moving into their spring feeding grounds. Those areas are basically from Cogden to Abbotsbury. You need to be targeting the clay beds on those marks. Look for areas of clay on the beach and use them as a starting point. Often you have to cast as far as you can, but in other spots the clay patches where the Plaice feed seem to be can be no more than 60 yds out. In one of my new articles I will show you how to find them. Other fish around at the moment include Rockling, Dabs, Pout and Dogfish. Not many Rays have been reported recently. Portland: The cold is really putting the Wrasse and Bass off. It should have no effect on the Pollock fishing. One mark that will start to produce in the next few weeks will be Church Ope Cove. If you hit the right areas on it then the variety of species can be incredible. Numerous Ray species, Sole, Wrasse, Bass, Pollock, Mackerel, and Mullet to name a few. Portland Harbour: Even the Flounder seem to have disappeared from the harbour. Weymouth Bay: With the Easterly wind a lot of people have avoided fishing along the sea front. If you are after some fish then you would do worse than going to Stone Pier. It is still producing Rockling, Pout, Pollock and small Whiting. Kimmeridge Bay: I fished Kimmeridge on Saturday and although I didn’t catch anything it gave me a chance to look at some ledges that I had not seen at low water before. I will be back there again in a couple of weeks for another try. The good news for that area is that the cliffs seem far more stable than I have seen them in a long time.